I first heard about RED January from people I was following on my Instagram account. 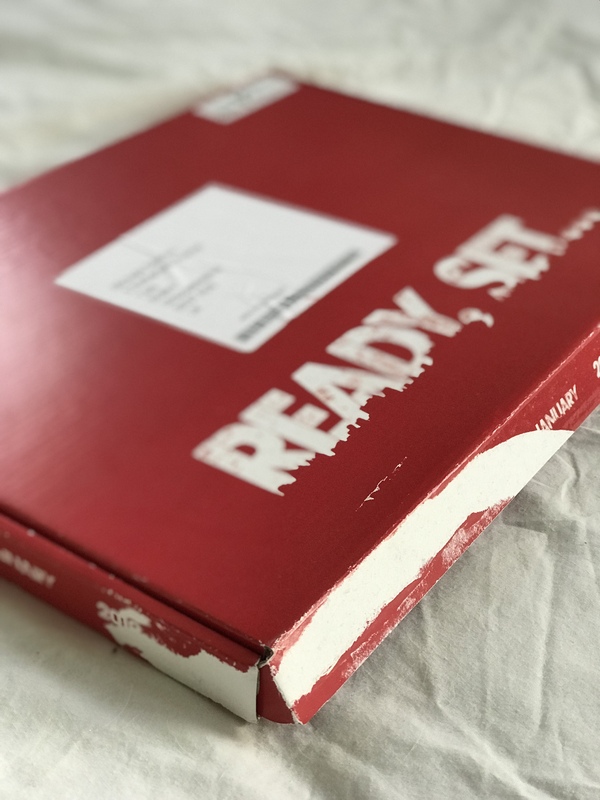 I had serious FOMO (fear of missing out) and I wished I’d heard about it earlier so I could do it too! If you don’t know what RED January is all about, let me tell you more. First of all, don’t be put off by the Run Every Day January slogan. The aim of the initiative is to support your mental health by doing something active every day, this could be walking, running, swimming, cycling, basically anything that gets you moving this January. 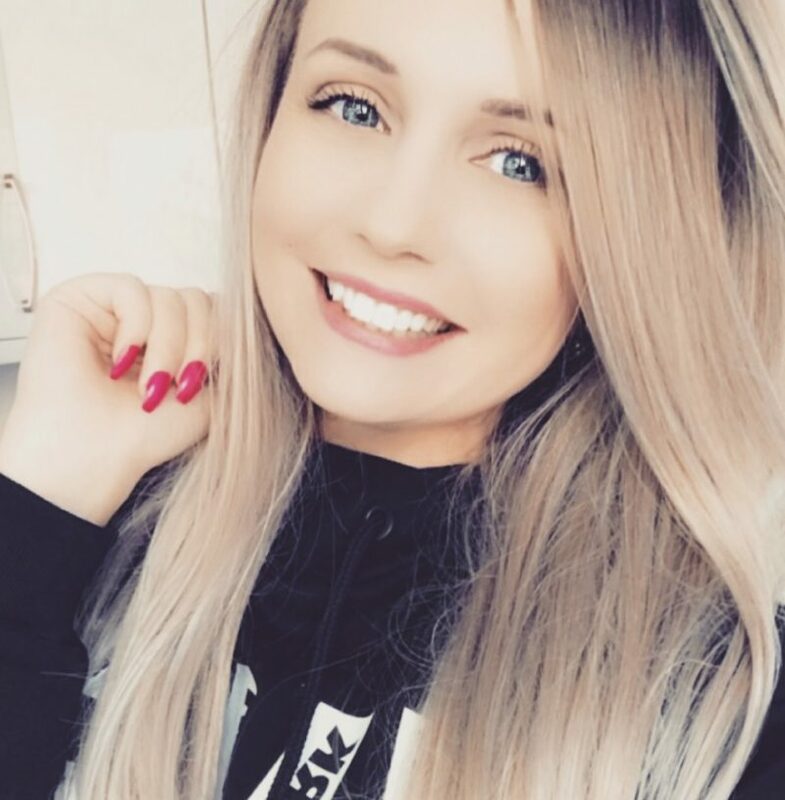 They’ve also partnered up with the leading mental health charity, Mind, to help raise funds towards the vital work providing information and support. There’s no doubt that there are positive effects from physical activity on your mental health and we all know that January can be a challenging time. It’s cold, it’s dark, we’re getting over the Christmas season/ holiday lbs and we’re also broke! 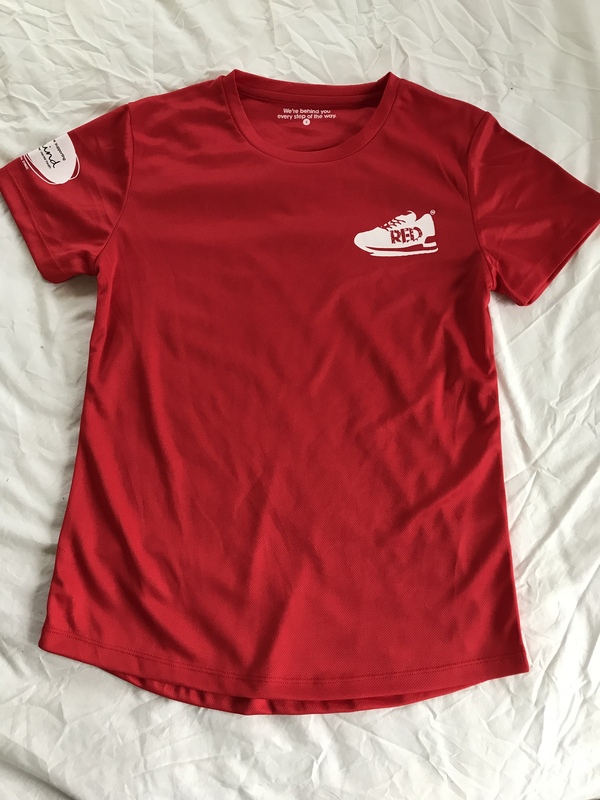 Following RED January 2018, 87% of REDers reported feeling significantly better physically and mentally after completing the challenge. I feel very strongly about encouraging others to get out there and be active and seeing others achieve great things too (this is one reason why I started my running Instagram account in the first place, it’s an actual online community that supports each other through the highs and lows of running, so if you’re thinking of setting one up, I’d highly recommend it). I’m trying to also bring RED January into my workplace by doing fundraising and encouraging people to get out there and do more exercise. So far on the agenda, we have a plank challenge to see who can be the champion plank-er, guess the sports balls in a jar, hula hoop challenge and a quiz. Who out there doesn’t want a happier workforce and colleagues… no-one that’s who. 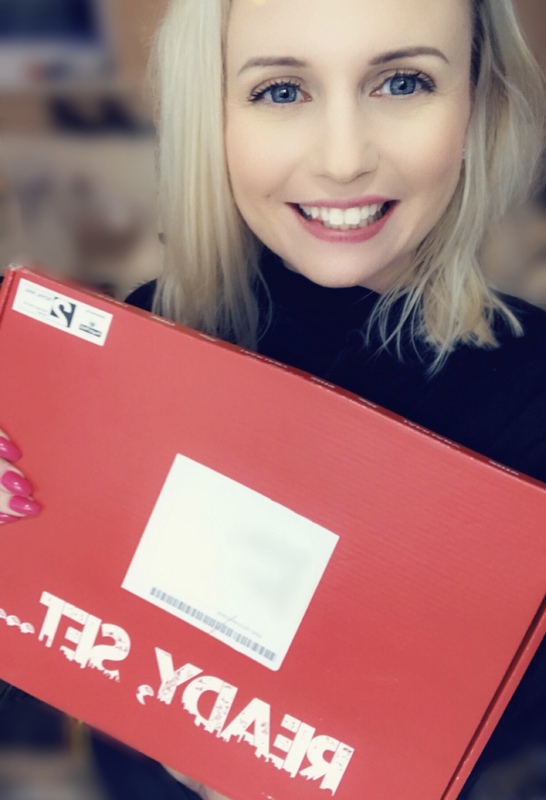 How am I getting involved in RED January? My plan is to run every day. That actually seems like a pretty terrifying prospect to me. Yes, I’ve run a lot in the past, yes I’ve done a total of 40 races in the last 2 years, but running every day! Sheesh! I’m pretty confident that I can do this though, I’m pretty determined once I put my mind to something. 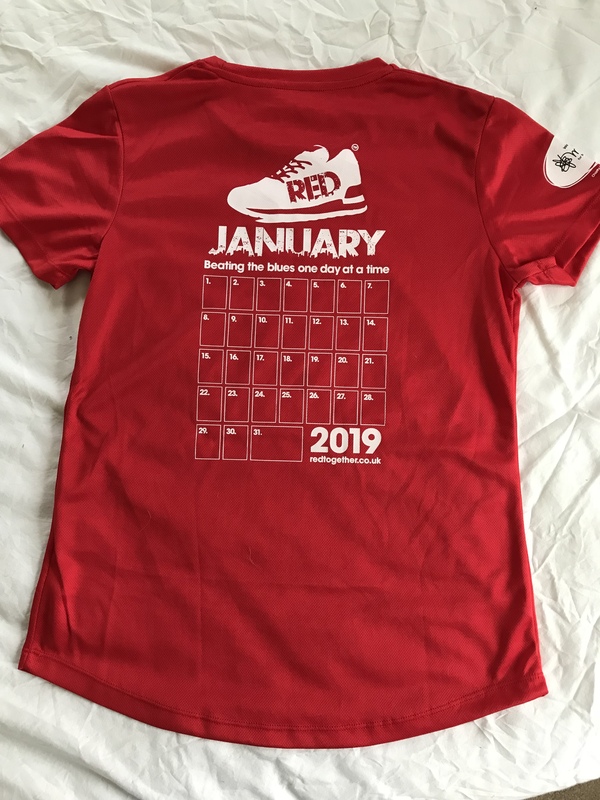 Not only that, when I signed up for RED January, I ordered one of their technical t-shirts for £10 so I can cross off each day that I’ve run. I’m going to purchase some little iron-on stars and stick one of those on every day to make it really pretty as some extra motivation. This sounds great! How do I sign up? 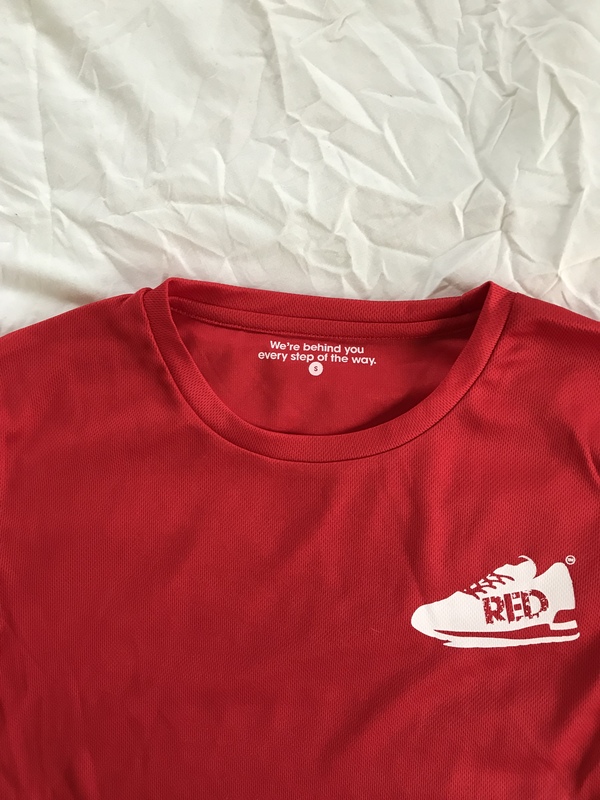 Visit https://redtogether.co.uk/ for more information and to register or https://www.mind.org.uk/redjanuary Both sites have tons of information, resources and ideas on how you can get involved. I’d love to hear about all of you that have signed up already and how you’re going to incorporate activity into your days and sharing this journey with you. I’d highly recommend following the hashtag #REDJanuary on Instagram so you can see other people who are taking part too and join the community. I’m fully expecting to only run half a mile some days when I have a lot going on, and that’s fine with me, as long as I’m getting out of the door with my trainers on I’ll be happy with that. 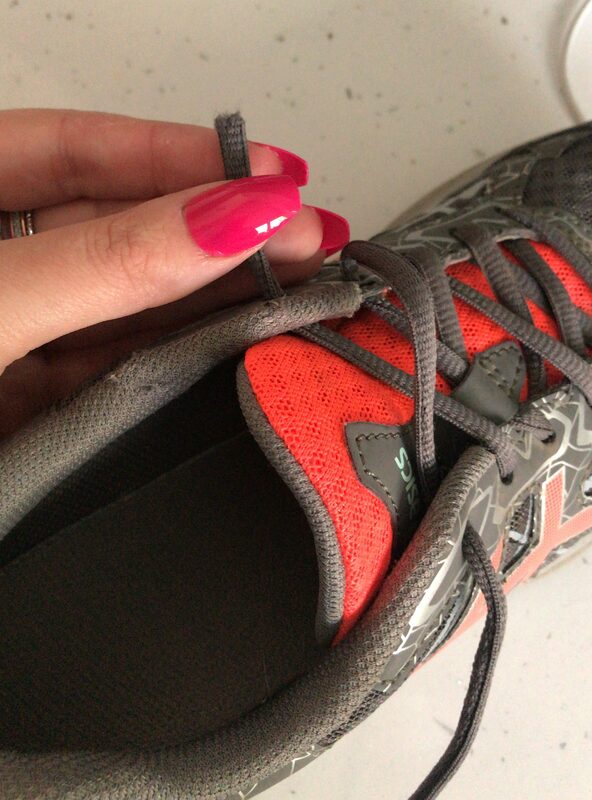 I have come across a stumbling block already though… my usual running shoes have been sabotaged by my house rabbit, Teddy, and he chewed one of the laces clean off! 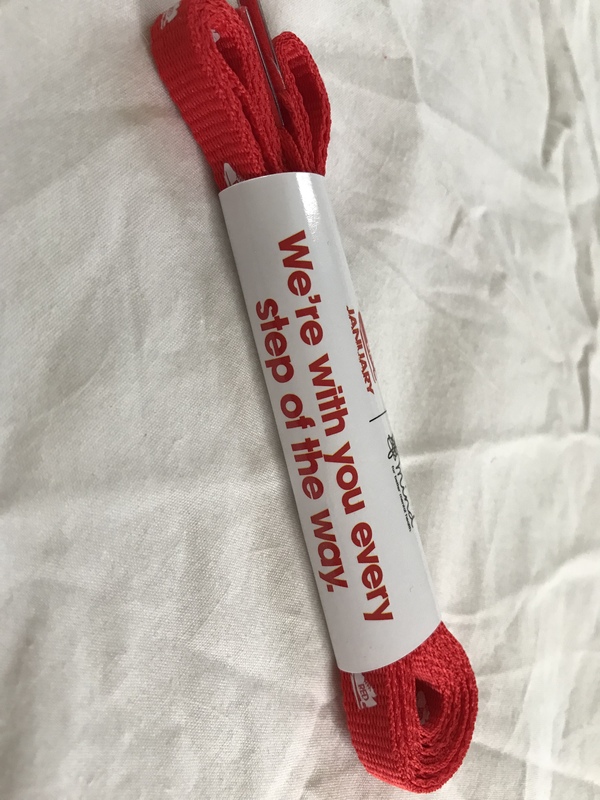 Luckily though, when you sign up for RED January, they send you a pair of beautiful red shoe laces so I’ll have to pop those on instead. Here’s what you get in the full pack when you sign up. 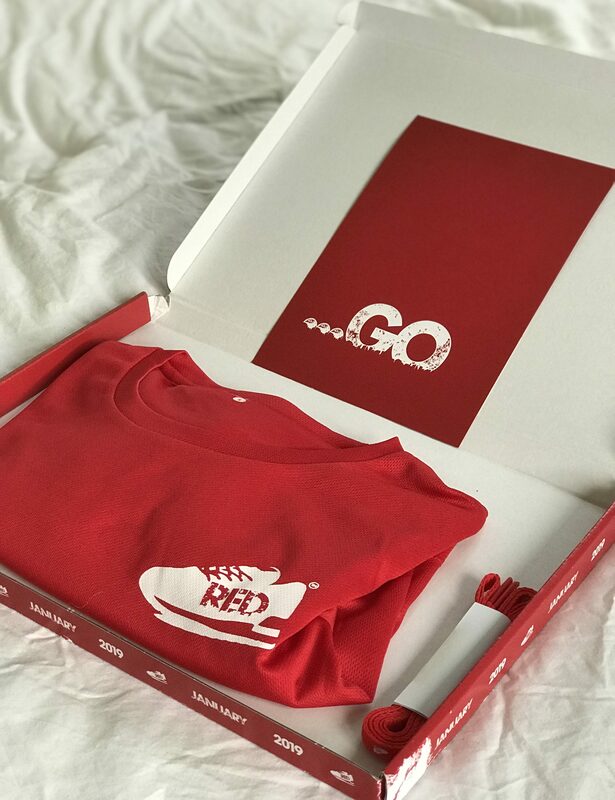 If I haven’t convinced you already, go to the RED January or Mind websites, check them out and I’m sure you’ll feel inspired and look forward to January as much as I am! What a way to kick off your 2019 New Year’s Resolutions! Good luck! Like you, I’m attempting the run every day thing! We can do it ?? it’s going to be great!